We combined the annual parish picnic with an open house for friends and neighbors in honor of our year-long centennial celebration. By moving the date up to before school lets out and vacations begin, we hoped more parishioners would be able to attend. Additionally, we have a great group of neighbors who are very supportive of us and understanding of our mission. We invited them to rejoice in our 100 Years of Faith and Service and thank them for their support. Our team of volunteers who worked to plan this event were Carla Bukalski, Clara Sage, Anna Clissold and Demetra Koelling. It was a wonderful event! Buffet, J2A Silent Auction, Entertainment. support local vendors and organizations. We hosted a catered buffet dinner, including gluten-free and vegetarian options, at the historic Nineteenth Century Club in downtown Oak Park. Using this space allowed us to combine our celebratory dinner with the J2A silent auction, which would normally be scheduled for this spring. Combining the two events reduced the overall cost to participate and opened the fundraiser for this summer’s pilgrimage to a larger audience. The ticket price for the auction and dinner was $30 per person, and a cash bar was provided. Making additional donations to the Centennial Fund. Purchasing space in our congratulations booklet. Soliciting advertisements for our congratulations booklet from local businesses and organizations. Please consider how you can help support this effort. Read our periodic requests for in the Messenger and weekly bulletins, and keep an eye on the bulletin board in the Parish Hall. St. Christopher’s is proud of its Century of Faith and Service in Oak Park. Please help celebrate, and pitch in where you can. 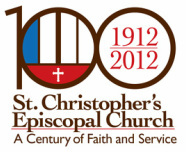 Read about our first 100 years! Click the cover below to download the History Book PDF.